Nothing makes me as anxious as ordering seafood in restaurants. I must look like a nutjob when I play twenty questions with a server, who more than likely has no clue about the exact provenance and life cycle of the fish or shellfish. At the very least, I need to know whether those shrimp and that salmon are domestic, imported, wild-caught, or farm-raised. And I can’t just have an oyster po’boy, either. “What kind of oysters?” I whine. Many people turn to seafood because they believe it a healthier choice than meat. I feel just the opposite. And several factors—concerns for overfished and polluted oceans, unease over the mystery that often shrouds imported products, personal taste preference—complicate my seafood choices. Do I have to give up delectable bluefin tuna because of sustainability issues? (The tuna population has dropped 80 percent in the last forty years, according to one marine study center, though the National Oceanic and Atmospheric Administration pulled the fish off its endangered list last spring.) Must I learn to like unattractive but abundant bottom feeders, such as slimy sea cucumber? Should I embrace imported shrimp, which accounts for 90 percent of shrimp served in restaurants and has watch groups concerned about farming techniques that overly rely on chemicals? Given all these considerations, the question of where to get good seafood in Atlanta often stumps me. The first name that normally shoots out of my mouth is Kyma. I find comfort in the restaurant’s display of fresh fish, bedded on ice for all to see. Meaty octopus and sleek branzino emerge from the kitchen cooked with equal skill. Chef Pano Karatassos’s favorite—the flame-colored, mean-looking Acadian redfish from Maine—isn’t a substitute for the much smaller and more distinctive rougets one gets in Greece, but it is a flaky, full-flavored specimen nonetheless. I feel absolutely confident recommending Virginia-Highland’s Goin’ Coastal, an offshoot of a restaurant started in Canton that’s focused on serving sustainably raised seafood. You won’t, for example, find mahi mahi from Ecuador on the menu: It tops the “avoid” list of all seafood watch organizations. Seth Hendricks, chef and co-owner, knows exactly which species of grouper that conservation experts endorse (black and red, from the U.S. Gulf of Mexico). He gets deliveries every day—”even Sunday”—and some of his regulars buy fresh fish directly from him. Hendricks sells a lot of steamed Maine lobster (harvested only by traps and with an eye for size, giving it one of the smallest ecological footprints of all seafood) and simply prepared shrimp from Texas. In his Lowcountry-style boils, he also occasionally offers lesser-known varieties of South Carolina fish, including jolthead porgy (“similar to a red snapper but not as sweet and a little more bony”), hogfish (“mild with subtle sweet undertones”), and wreckfish (“a thick, meaty fish that feeds mostly on crustacean and is delicious”). “The sustainable target is always moving,” he says. The staff hands out Georgia Aquarium’s wallet-sized guides to environmentally sound seafood options. I am glad to see seafood boils making a comeback in casual restaurants. They tend to combine ingredients such as corn, potatoes, and andouille with a modest amount of fish, a thrifty alternative to the huge fish steaks and other mammoth portions of seafood found at more expensive establishments. 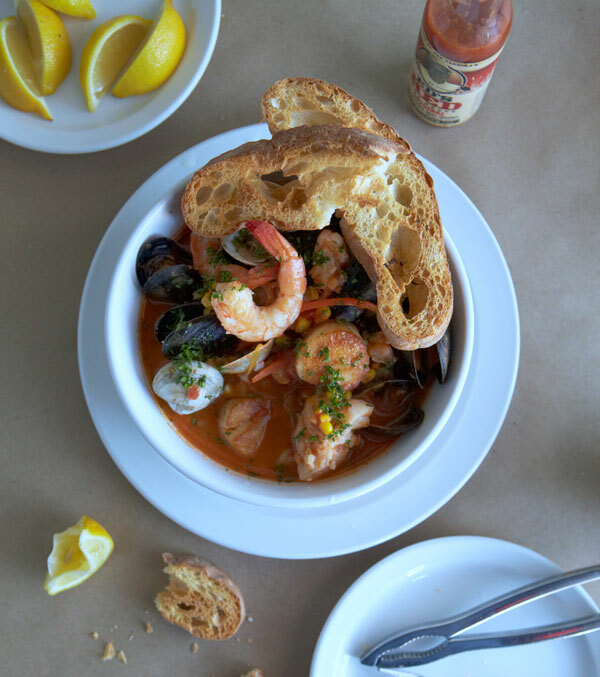 Decatur’s new, nautically themed Harbour Bar & Fish House, for instance, has an entire section of the menu dedicated to various versions made with crab, shrimp, salmon, lobster, and oysters. My favorite ways to eat seafood are, in order, raw (but only in Japanese-run establishments such as Sushi House Hayakawa, Nakato, and Tomo), steamed (any decent Cantonese restaurant), boiled (hello, Sichuan cuisine), fried in cornmeal, grilled, baked, and last, broiled, which feels greasy and dry. I hold a vague superstition that fish should be eaten in restaurants only from Wednesday through Friday, the days I perceive as having the freshest deliveries. My appetite often diminishes in front of scallops held so long in the refrigerator that they achieve a scary embalmed texture, mussels that don’t open all the way, and farmed salmon that tastes like dyed toilet paper. And I must confess: Some of the fish that rate highest on reliable websites like Monterey Bay Aquarium—dedicated to educating the consumer about the dangers of overfishing, by-catch waste, and mercury levels—hardly taste like fish to me. Farmed tilapia may be a step up for people whose taste buds were informed by Gorton’s fish sticks, but I much prefer less touted but also eco-friendly herring, mackerel, and anchovies, available fresh, salted, pickled, and smoked in ethnic markets. I have learned to eat American catfish, whiting, and croaker—something inconceivable in my childhood defined by sole meunière and fresh sardines—in places such as Merkerson’s (404-758-9079), a modest fish market and restaurant on Ralph David Abernathy off I-20. My best tip for eating seafood out: Find a chef whom you respect and trust will do right by you. At the very least, stay away from questionable freezer-to-fryer cookery performed in restaurants that push batter as a food group. Christiane Lauterbach is our restaurant columnist.